This magnificent Spa delivers a range of world-class treatments to balance and energize your being. It is a very private and tranquil retreat, to suit your every need. The gorgeous setting gives a gentle atmosphere that helps the guests even more to relax. 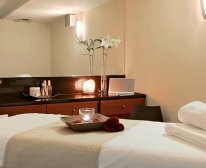 This Spa is created for those who need time out so they can restore their synergy. Lake Pleasant only provides the best professional care in a wonderfully relaxed environment, where nature shows its breathtaking face. You as guest can know beforehand that when you leave Lake Pleasant, you will feel pampered, rejuvenated and relaxed. They offer all the best in body and beauty treatments, and also have steam rooms, sauna rooms, a gym open to guests and an indoor heated relaxation pool. The Spa on the Lake recommend you arrive at least 15 minutes before your treatment begins. A bathing suit is required for all wet areas (pool, sauna and steam rooms). Robes and towels are supplied on arrival at the Spa. Please be sure to mention any health considerations when booking appointments. Prior, during and after treatments guest are welcome to use the relaxation area with compliments. All Spa treatments are unisex. Running late? While every attempt will be made to accommodate your late arrival, treatment times will be shortened should this not be possible. 8 hours notice is required to avoid 50% cancellation charge. They will however assist in rescheduling your appointment where possible. Operating Hours: Spa Treatments: daily by appointment.